Established in 1954, F.J. Brennan is a vibrant and engaging place to study, socialize and create memories. The school is centrally located within the city; close to shopping, restaurants, public transportation, parks, etc., allowing students to maintain a healthy and active social life. Brennan is one of the original schools in Windsor and started as an International School hosting students from all over the globe. It has for many years enjoyed a wonderful reputation locally for both academics and athletics. The school offers a large number of extracurricular activities that include the Cardinal Newspaper club, Debate team, Physics club, Best Buddies, Goodfellows Charity drive, Jazz Band, Choir, Math competitions, Award Winning Drama Programs and over 15 sports teams per year. As well, the school is home to a specialist high skills major program in Arts and Culture and another specialist program in Sports. They have a state-of-the-art auditorium, gymnasium and physical-weight training facility. Dual Credit Program with St. Clair College in multiple disciplines that include Acting and Improvisation, Health and Wellness Fundamentals, Foundations of Exercise Training, Photojournalism, Baking and Pastry Arts, Horticultural Science and many more. Building on a rich tradition of excellence, the Assumption community is proud to have been educating students for over 140 years. Assumption was founded in 1870 and is a school steeped in history and tradition. It has for many years been a very highly regarded institution, attracting students from all over the world. The Assumption motto, “Teach me Goodness, Discipline and Knowledge”, continues to be a motto of action and shared responsibility. Assumption is located in the heart of the city, close to the University of Windsor and only a kilometer from the American border. The school is home to our International Baccalaureate Program which attracts some of the brightest and best students from across the region. As well, the school is home to a specialist high skills major program in the area of Culinary Arts. The school offers a large number of extracurricular activities that include the Math Club, A Squad, Art Club, Chess Club, Debate Club, Drama Club, Environment and Outdoor Club, and Science Fair, as well as a number of individual and team sports. The Assumption Purple Raiders, as they are known, enjoy a wonderful school community with tremendous school spirit and pride. Dual Credit Program with St. Clair College in multiple disciplines that include Introduction to Canadian Business, Chemical Laboratory Techniques, Fashion Design, Web Design, Computer Animation and many more. 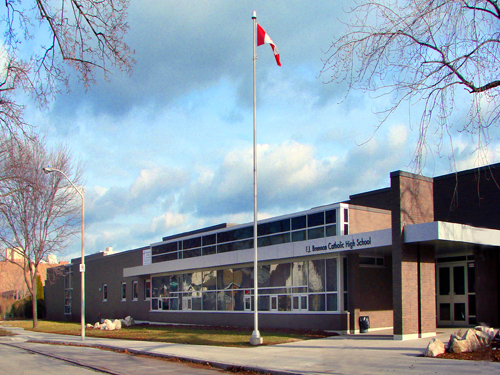 Founded in 1985, Catholic Central is located near downtown Windsor. The greatest asset at Catholic Central is their diversity and English as a Second Language programs, which include small class sizes and additional support services in guidance and academics. They have numerous onsite support staff who serve as translators and support for students. Canadá, Austrália, Nova Zelândia, França, Espanha, Alemanha e Suíça.